While on vacation recently I began craving pistachios. To my surprise there wasn’t a single pistachio kernel to be bought. They were absolutely unavailable in the Philippines where my husband and I were visiting our son in Manila. The notion of deprivation only served to spark my imagination. Soon pistachio thoughts drifted into a number of possible recipe ideas. 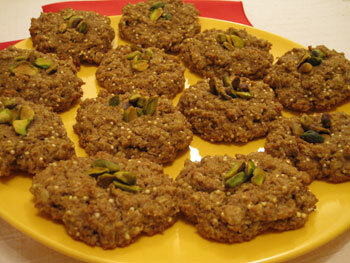 The most potent of the creative sparks began to take shape in the form of cookies enhanced with ground pistachios. These cookies would be soft and chewy but dotted with a touch of crunch. And being so far away from home, I was surrounded by exotic herbs and spices. I could imagine infusing those pistachio cookies with an awesome combination flavors that came from the nuts’ own Middle East and Caucasus homeland—enhancers like rose water, cardamom, and saffron. It worked! And my brief separation from those wonderful little nuts only made me grow fonder of them. As a result, the cookies not only have the ground pistachios comprising part of the flour, but they also have an appealing cluster of the nuts to garnish the tops. Because this recipe contains no eggs, the cookies have no cholesterol. I’ve added liquid lecithin from soy to help bind the dough together. You can find lecithin at natural food markets. 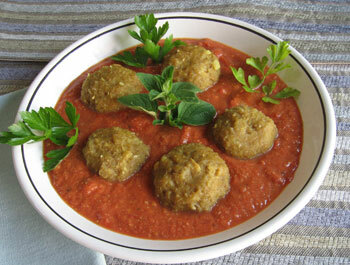 Millet provides the delightful touch of crunch and certainly adds to the cookie’s nutritional value. This easy-to-prepare recipe is based on an old-fashioned oatmeal cookie recipe. I’ve adapted it to add unique texture and exceptional flavors that make these little treats quite special. I hope you find them as compelling as I have. 1. Preheat the oven to 350 degrees and line 2 large jellyroll pans with parchment paper. 2. In a large bowl combine the flour, rolled oats, brown sugar, millet, baking powder, cardamom, soda, saffron, and salt and mix well. Break up any brown sugar lumps. Set the mixture aside and prepare the wet ingredients. 3. Measure 1/2 cup of the pistachios, and set it aside. Place the remaining 1 cup of pistachios into the food processor and pulse and process until finely ground into a powdery meal. Add the bananas, margarine, rose water, lecithin, lemon juice, and vanilla extract and process until the mixture is smooth and creamy. 4. Add the wet ingredients to the dry ingredients and mix well. The batter will become quite firm. Form heaping tablespoons of the batter into 2-inch cookies, placing them about 2 inches apart on the baking pan. Flatten them slightly and press a tiny cluster of the reserved 1/2 cup of pistachios into the center of each cookie. 5. Bake for 13 minutes. Then, reverse the positions of the cookie sheets and bake 4 minutes longer or until the cookies are nicely browned on the bottom. Remove the cookies to a dish to cool completely. If the cookies on the top rack need browning, move them to the bottom rack for an extra 2 to 3 minutes. The cookies will firm when completely cooled. 6. Store at room temperature for up to 3 days. For longer storage, freeze the cookies in layers with parchment or waxed paper between the layers.